The dashboard gauges in your car tell a complex story about everything from your current rate of speed, to the state and health of your engine, and even whether or not things like your headlights are switched on. Different vehicles have different gauges, and some instrument panels are much more complicated than others. But when the gauges in your car stop working, it’s not a situation you can safely ignore. When one gauge stops working, the problem may be in the gauge itself or a bad sensor, while all the gauges cutting out at the same time often indicates a blown fuse or a defective instrument cluster. None of the gauges work. If none of the gauges work at all, the problem may be a blown fuse or a defective instrument cluster. If the gauges all read low or erratic, there may be an issue with the voltage regulator that feeds the instrument cluster. If the gauges are all pegged at the highest possible reading, there could be a wiring problem or a bad instrument voltage regulator. An individual gauge doesn’t work. If the oil pressure, coolant, charge, or gas gauge doesn’t work or works erratically, the problem is in the gauge, wiring, or sender. Speedometers are unique in that some of them use physical cables instead of sensors, so a speedometer not working can also indicate a broken cable or stripped gear. One or more dashboard warning lights don’t work. If one or more warning lights fail to illuminate when you first turn the key on, it usually indicates a blown bulb. If none of the lights come on at all, check the fuses and wiring to the instrument cluster first. If a warning light comes on and stays on when the engine is running, that usually indicates a problem with that specific system. There are a lot of different types of instrument cluster designs and configurations, but when all of the gauges in a car stop working at once, the problem is usually either a fuse or wiring problem. The first step in diagnosing this type of issue is to identify fuse associated with the instrument cluster or gauges. The fuse should have power on both sides when the ignition key is turned to the on position. You can check this with an inexpensive test light or multimeter, or take your car to a mechanic if you don’t have the right tools or aren’t comfortable digging into a diagnostic like this. If the fuse is good, the next thing you or your mechanic will want to do is to check for power at the individual gauges. This usually requires removing the instrument cluster, which can be quite difficult and time-consuming in some vehicles. At a bare minimum, you will probably have to remove some trim pieces and unscrew the cluster to pull it free. The difficulty level is usually on par with installing a new car radio, so if you're comfortable with that job, you can probably handle this one. What If the Indicator and Dash Lights Don’t Work Either? If your gauges don’t work, and your dash lights and indicators also fail to illuminate, that’s a clue that there may be a ground issue. This assumes that you have already checked the gauges fuse and determined that it’s in good working order. When an instrument cluster isn’t properly grounded, you’ll typically find that the gauges and dash lights fail to work or only work intermittently. You may be able to check the ground by looking up under the dash with a flashlight, but you will have to actually remove the instrument cluster in many cases. What If the Gauges Seem Erratic or the Needles Are Pegged? When the gauges seem to move erratically, or they are pegged at the highest possible reading, the problem is usually a bad component like an instrument voltage regulator or a bad ground. Erratic gauges, or gauges that seem to read uniformly low, are usually caused by a bad instrument voltage regulator. In some cases, you may be able to remove the regulator, clean the connector terminals, and reinstall it. Gauges that all read full all the time are usually caused by a loose or bad ground. If you are able to locate the ground, either visually or with the help of a wiring diagram, you’ll want to make sure that it is secured tightly and free of rust or corrosion. In some cases, you may find that the entire instrument cluster is bad. For instance, if you have an electronic instrument cluster that doesn’t have separate gauges that receive independent inputs from individual sending units, a total failure of all the gauges often requires the replacement of the entire cluster. Early electronic instrument clusters had digital readouts much like an LCD alarm clock, while the modern equivalent often simulates analog gauges in a much more sophisticated way. In either case, diagnosing and repairing or reconditioning this type of instrument cluster is outside the realm of the typical do-it-yourselfer, unless you want to just replace the entire thing and hope for the best. What If Just One Gauge Doesn’t Work? When a single gauge stops working, the problem is either in the gauge, the wiring, or the sending unit. If you are comfortable locating and removing sending units and sensors, you can diagnose this type of problem yourself. Otherwise, you’ll have to take it to a mechanic. 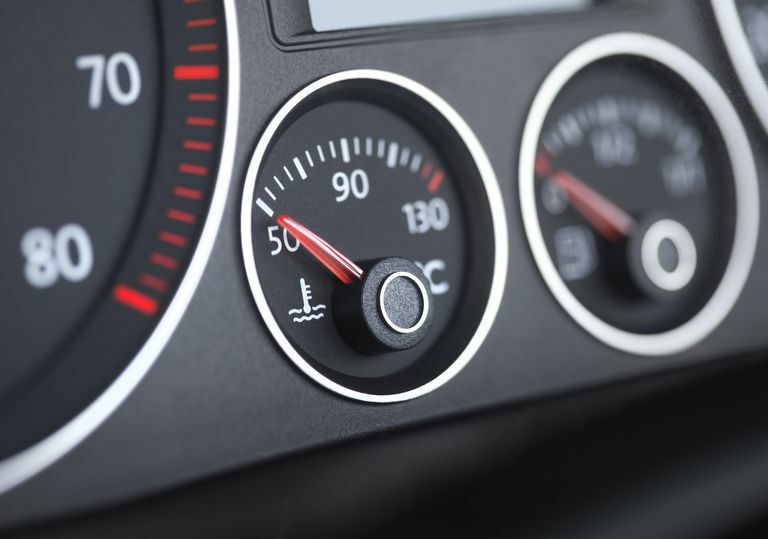 Using your coolant temperature gauge as an example, the diagnostic procedure involves locating and disconnecting the sending unit. With the ignition on, the gauge should register cold. If you connect the sending unit wire to ground, the gauge should switch to read hot. If the gauge moves as expected, then you can suspect a bad sending unit. If the gauge doesn’t move when you ground out the sensor wire, then you can suspect a bad gauge. Similar tests can be performed on all of the gauges in your instrument cluster, although the specific procedures can differ from one application to another. While all gauges can be either analog or digital, speedometers are unique in that they can have either mechanical or electrical inputs. All other dash gauges are connected to sensors or sending units via wires, while your speedometer may utilize either a speed sensor or a physical cable. In vehicles that use cables, the speedometer is physically coupled to the transmission via a cable. The cable is usually square on both ends or square on one end and slotted on the other. When the cable breaks, the gauge may not move at all, or it may jerk a little intermittently. The fix for that problem is to simply replace the speedometer cable, which involved unbolting it from the transmission, disconnecting it from the instrument cluster, and then sliding it through the firewall. In many cases, this also requires removing the instrument cluster itself. Most modern cars and trucks use speed sensors instead of cables, and the transition started in the 1990s. Some vehicles even have both a speed sensor and a cable, in which case the cable usually drives the speedometer while the speed sensor or wheel sensor tells the computer how fast the vehicle is moving. The only way to know for sure what your car has is to either look up your make, model and year or to physically inspect the back of the instrument cluster. If there is no cable attached to the back of the cluster, then your vehicle has a speed sensor. In vehicles that have speed sensors, the easiest way to determine whether the sensor or gauge is bad requires the presence of a cruise control system. Since cruise control also makes use of the speed sensor, it won’t operate correctly, or at all, if the sensor is bad. If you find that your cruise control works, but your speedometer isn’t working, then you should suspect a bad speedometer. The reverse is also true, so if both your speedometer and cruise control are malfunctioning, you can suspect a bad speed sensor or faulty wiring. In less common circumstances, the electronic control unit (ECU) could also be malfunctioning. If you take your car to a qualified technician, they will be able to connect to the ECU to read trouble codes and other data. Using specialized testing equipment, they will also be able to actually test the speed sensor itself. What If It’s Dashboard Warning Lights That Don’t Work? While many vehicles have gauges that show specific information about everything from the state of the charging system to the temperature of the coolant, some cars and trucks have warning lights. These warning lights are designed to illuminate when the input from a sending unit or sensor falls outside the expected range. So instead of a needle telling you that your coolant is 230 degrees Fahrenheit, and in the red danger zone, a similarly red warning light will blink on to inform you that the coolant is hotter than it should be. These lights, and others like your check engine and ABS light, are designed to come on when you turn the ignition key to the on position, which is referred to as a bulb test. If one or more of the lights fail to illuminate, it usually just means that the bulbs are burned out. If none of your dashboard warning lights turn on, including your check engine light, then it’s usually a fuse or a ground issue. This type of problem is diagnosed the same way as a gauge that doesn't work, so you will have to check for power at the appropriate fuse and verify that the instrument cluster ground is okay. If those things check out, then the problem is usually a bad sending unit or wiring. Regardless of whether you're dealing with gauges or lights, the basic troubleshooting process will always be determined by the number of failures that happen at the same time. So if it's just one gauge or light that doesn't work, you'll follow one basic procedure, and you'll follow another if everything stops working at once. When all of the gauges or warning lights in your car stop working at once, the problem is something that all of the gauges and lights share in common. Check the fuses first. The fuse may be labeled gauges, cluster, or something similar. This fuse should have power on both sides with the ignition in the on position. If the fuses check out okay, then check for power at the instrument cluster. If the instrument cluster has power, then check for ground. A bad ground connection can cause a total failure or erratic readings. When all else fails, the instrument cluster itself may have to be replaced. When only one gauge or light stops working, the problem is either a bad sensor or a bad gauge. Diagnosing a single bad gauge or warning light requires you to locate the sensor that connects to it. Disconnecting the sensor is usually the first step. Depending on how the gauge works, disconnecting the sensor, or connecting it to ground, may allow you to test the operation of the gauge. The diagnostic procedure for gauges and sensors differs from one application to another. In some cases, you may find that the problem was caused by a loose connection. When a speedometer with a physical cable doesn't work, the problem is a broken cable or bad speedometer. If you can locate where the speedometer cable connects to the transmission, diagnosing this problem is very easy. Manually turning the end of the cable that inserts into the transmission with your fingers should cause the speedometer to move. If the speedometer doesn't move, disconnect the cable from the speedometer and turn it manually. If you don't see one end turn when you manually rotate the other, the cable is broken internally. If it does turn, then the speedometer is bad. One of these solutions should solve your problem.